I'm absolutely thrilled to host Adrienne Sharp here. She entered the world of ballet at age seven and trained at the prestigious Harkness Ballet in New York. 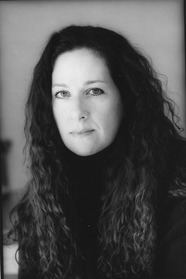 She is the author of The True Memoirs of Little K, White Swan, Black Swan and The Sleeping Beauty. 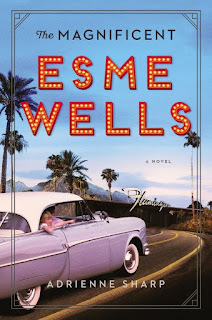 Her latest, The Magnificent Esme Wells, is about love, loss, showgirls, gangsters and the golden age of Hollywood and Las Vegas--and it's as extraordinary as Esme herself. Says Publisher's Weekly, "Nothing if not magnificent." I say it, too. Thank you sop much, Adrienne, for being here. First, can we talk about the voice of Esme? It was so intimate, so alive, that I felt as if she were sitting across from me. How did that come about? Through much trouble and wasted time, like almost all things having to do with writing. My character Esme actually started out as a young boy, Flynn, with his perspective rendered in third person. I’d just finished four years of work on my last novel, The True Memoirs of Little K, employing the first-person voice of a hundred-year-old woman looking back on her life in imperial Russia. So I didn’t want to write once again from the perspective of yet another girl or woman, or from, again, the first person point of view. But, unfortunately or maybe not so unfortunately, Flynn’s character fell flat. So I tried him again as a middle-aged gay man, a choreographer, writing about his parents and his mother who became the burlesque dancer that Esme ultimately becomes. That wasn’t working either. Then I tried telling the story by alternating first person between Esme’s mother and her father. Also not good. Finally, I turned the child Flynn into the child Esme, and somehow with that change, her spunky, observant character emerged and she took over the material. I always want to know what was the moment when you knew that this was your next book? Was anything haunting you? My mother’s parents abandoned her when she was a little girl, leaving her in a Baltimore orphanage while they took off to Los Angeles with their new baby boy. I think they imagined a baby would be a lot less trouble to care for than a seven year old (who had to go to school and do homework, etc) in their new breezy life. I never met these grandparents, but I heard stories about them and about my uncle’s miserable years with them. They lived in the cheap hotels that sprang up around the big racetracks of Hollywood Park, Santa Anita, and Del Mar, where my grandfather bet and sold tip sheets. My uncle never went to school and instead hung around the streets and the track, a small illiterate urchin. Both of them envied each other’s lives—but I can tell you this, my uncle’s life is one long, broken wreckage and my mother’s life one of success and stability because she was spared the parents she longed for. With this novel, I collapsed together the experiences of both my mother and my uncle, and I imagined a life for my character out West with these reckless narcissists. How different is the finished novel from where you started? I had intended the novel to focus solely on Esme’s childhood with her parents in Los Angeles, their eventual move up to the San Fernando Valley where I imagined her mother might feel suffocated as a housewife, and ultimately the family’s decision to head to Vegas where the mother could dance and the father could gamble. I thought the book would end with the three of them in the car, heading that way. But Vegas became too interesting to me and Esme as a child and then a young woman too interestingly malleable to ignore, and so the book shifted and now covers two periods: 1939 Los Angeles and the early Vegas of the forties and fifties. What was your research like? Did anything spin the narrative into a new direction? What surprised you the most? Reading about Las Vegas and the blossoming of the early vaudeville-like dancing girls of the early forties into the gorgeous iconic showgirls of the late fifties and early sixties are part of what led to the development of all those Las Vegas sections in the book. As well, the discovery that Vegas was built by Jewish mobsters and racketeers, which I didn’t know, and that it was a major depot for drug trafficking and money laundering, which I also didn’t know, made the city irresistible. Hollywood may be one Jewish empire, but Las Vegas is another, built by its own rough-mannered moguls who made a place for themselves in the desert. I underlined one of your last sentences, which spoke of the “dirty radiant light” of Vegas, which I think gorgeous encapsulates what Vegas is, the sense that if you dig among the debris, you might find a jackpot. Can you talk about Vegas then and now, please? Early Vegas was low-key. The hotels were smaller, built to a smaller scale, the casinos were smaller and more intimate with few tables, the hotel rooms themselves were simple and cheap, and the food even cheaper. Vegas was like a family, everybody knew everybody on the Strip, and the relationships between the new hotel people and the original ranchers and residents were somewhat fraught. Polite society vs criminal interlopers. By the late fifties, the hotels were starting to add towers, and by the sixties the Strip was beginning to turn into the spectacle it is today, with giant themed hotels and huge impersonal casinos and the hundreds of retail shops within. I’m probably the only person who goes to Vegas and asks for a desert view, not for a view of the Strip, because that Paradise Valley desert is the truly magnificent landscape. And, now, of course, with that horrific massacre at Mandalay Bay, Vegas seems terrifying in its excesses, a stage for every deadly sin. I’m working now on a novel set during the summer of 1975, about a family besieged by illness and ambition, family I knew. I found out recently one of their sons was murdered. He and his charismatic family have haunted me for decades. Now I’m even more haunted. His mother and grandmother are also dead, and so I want to celebrate their lives and the restless energy that drove them all. The title of the novel underwent as many revisions as the book. First it was called Hollywoodland, then Lake Hollywood, then H, then The Abandon, then The Hour of Two Lights, then Survival City, then The Haphazard Education of Baby E, then The Miseducation of Baby E, and finally, The Magnificent Esme Wells. I think I like that one best of all, which is good, since it’s been elected the title!